Shopper Decision Making – how and where is it happening now? Daniel Tripolitano from ShopAbility discusses ways shoppers make decisions, and things to consider when attempting to influence shopper decision making, for Retail World Magazine. I recently attended the Path to Purchase Summit, and it got me thinking that there is an ever growing amount of “stuff” impacting on our decision making. The days when TV advertising equalled driving people to shelf are over. The days where store influence equalled purchase are becoming a distant memory. Nowadays there are iPhones, tablets, apps, Facebook, Twitter, QR codes, AR codes, Google, YouTube, blogs, Haul videos, product reviews, CHOICE, loyalty programs, e-commerce. The list goes on and on. Don’t get me wrong, advertising still matters, stores still matter, but all this “stuff” now makes influencing a shopper more complex and difficult. At the very heart of influencing shoppers sits decision making. Understanding decision making helps us to manage a number of aspects that influence shoppers to varying degrees. 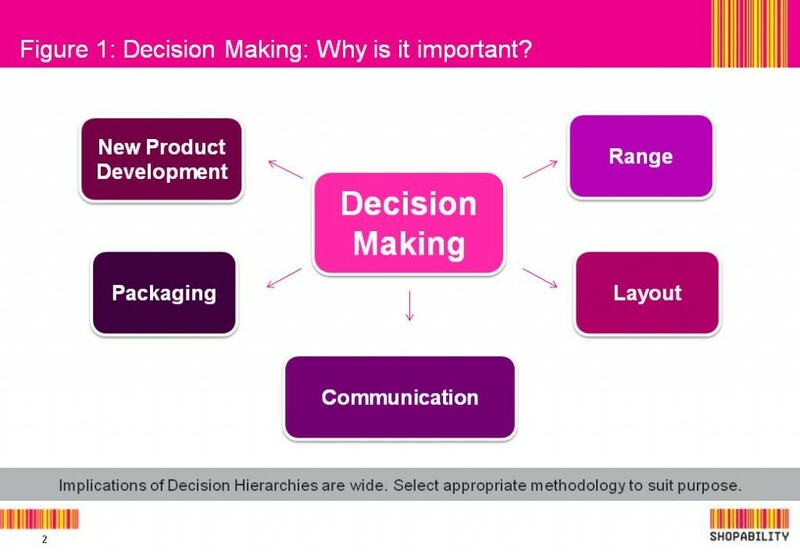 Decision making has always influenced packaging, communication, range, new product development and layout (see Figure 1). But now, with a more complex path to purchase, we need to think more and more about how pre-store, in-store and post-purchase impacts on shopper decisions. If you get these right then ultimately you have a more satisfied and loyal shopper. Now for the hard part, how on earth do we make sense of this new and complex world? “The trouble with market research is that people don’t think how they feel, they don’t say what they think and they don’t do what they say”. What David Ogilvy said then is as true now as it ever was, except now there’s more “stuff” which makes it even harder to understand. I love this quote because it actually hits at the very heart of what we are trying to understand when it comes to making decisions: how people think, what do they say and how do they feel. I wish I could say I had all the answers, but I don’t, and I haven’t seen anyone yet who has all the answers either. In my research, however, I have come across some key points to think about when looking at decision making. There are many ways to skin this cat and each have valid points. But before you start to understand any decision making process, ask yourself this, what do I want to do with this? Figure 2 illustrates some different lenses for measuring decision making. As we know, people have a hard time saying what they think. For example, it’s hard to tell you what I thought about when buying that carton of milk. Shoppers don’t necessarily know (ie they are on auto-pilot), or they might be able to tell you what’s important (eg full fat, pack size, brand, etc.) but have a hard time telling you which one is more important than the other. The key here is that we don’t just measure what they say but also measure what they do. By studying actions, together with what people say, gives us an insight into how people make decisions and more importantly what they do and what they say they do. Measuring ‘what they say they do’ is just as important as ‘what they do’ but they have different applications. ‘What they do’ can be useful in uncovering new product development opportunities, designing layouts and range; while ‘what they say they do’ is paramount to developing communication on the path to purchase. For example, if you think about pet food, one of the key aspects that will determine whether a shopper will buy it is whether their pet will eat it. This immediately divides the products into will buy and won’t buy. This is a ‘soft’ measure that could be touched on in communication but would never really come out from derived data. This also raises the point that shoppers aren’t always rational beings (are they ever?) so qualitative research is often very useful to really uncover why they do what they do. One thing to keep in mind is do not to think that just because you understand what they do, you can now design a layout. Take care to understand how people navigate the aisle, which is just as important as decision making. For example, there are a number of categories such as beverages and feminine hygiene to name a few where colours and logos are vital for shopper orientation. These aspects are often not measured in decision making and yet are fundamental to shopper decisions at shelf. With almost all shopper research we as researchers and manufacturers often feel that you need to talk to shopper at shelf to get to the heart of the matter. And most of the time, I’d agree. Decision making is no different, though I would argue that with a more complex path to purchase you need to talk to shoppers about the different points in time where they made decisions. When talking to shoppers at shelf one can really get to what are the most important things that determine why a shopper picked up a particular product. However, this is the last decision in the process! Obviously this is important, but it tends to ignore how the shopper actually got there. For example, let’s assume that a shopper is shopping for a beverage. When asked about their decision making process at shelf, they might say they bought this brand because it was on promotion. The logical conclusion from this is to pour all your funds into promotion to influence the shopper at shelf. The issue here is that when asking someone at shelf why they bought something is naturally going to lead a shopper to tell you about the last decision they made. Suppose, however, that this same shopper had decided to choose the supermarket channel (as opposed to convenience, petrol, etc) because they needed to buy a number of items for a children’s birthday party, they then decided they were going to buy Cola (vs. other flavours) because that’s what kids like, they had decided pre-store that they would only buy Brand A (vs Brand B) because none of the kids like Brand B and once they got instore they decided to buy a 2 litre pack size over and 3 litre pack size because it was better value. Only by looking at the decision making process along the entire path can we actually tell that price is actually the last decision to be made and the reason is to decide between pack sizes. If you own Brand B in this situation you can have the best promotions and it is not going to help you because the brand decision has been made way before they have actually got to shelf. My advice here is to ask both in-store and away from the store to really get a feel as to what matters. Decision making is often asked about the last occasion a shopper shopped for a certain item. This is seen as the best way to get to get an accurate read on the actual occasion rather than what shoppers ‘generally do’. Interestingly, there are other ways of measuring decision making over a period of time (ie looking ‘longitudinally’ at the decision making processes of the same people over a period of time). This is actually a very good way of understanding decision making over multiple occasions. The difference between the two is minimal, however, the applications are vastly different. The occasional measures help to develop layout decisions while longitudinal measures help to develop range and NPD ideas. The most important thing to ask yourself is, what do I want to do with this? The world would be a lot easier if we could stop there, but understanding how people make decisions is only part of the equation. 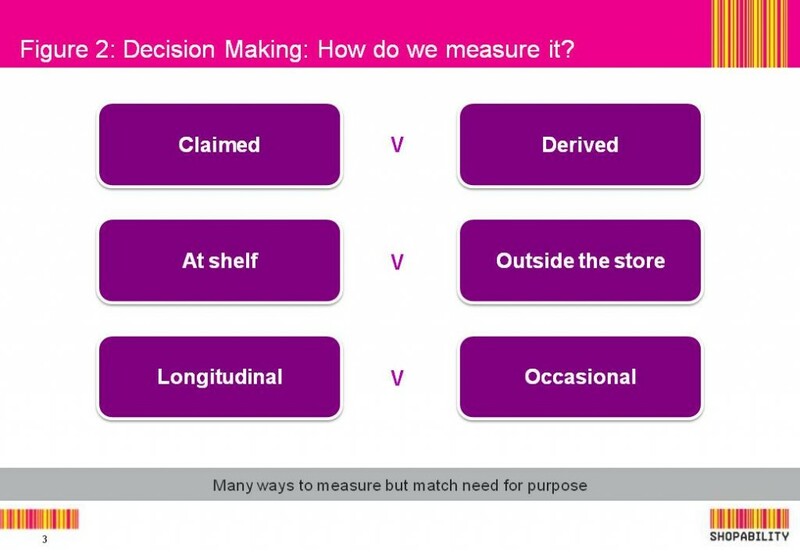 When looking at decision making it’s also important to look at several other lenses: who are our shoppers, what occasion are they shopping for and when or where do they make decisions? Fundamental to all shoppers’ decision making process is understanding who they are. Who they are guides their decision making. For example a female in older family (ie with teenage kids) makes their decisions on a completely different basis to a female in a DINK (double income, no kids) based household. But it doesn’t just stop there. What sort of involvement do they have in the category? Are they a heavy or light buyer? Where do they live? Etc etc. The point is that a shopper’s decision is partly based on who they are, so we shouldn’t just look at decision making as a whole but also based on who our different shopper types are. Occasion based marketing hasn’t really taken off in this country yet, but when it’s done properly it can be lucrative. As we’ve seen from previous examples, understanding occasion is key. If we don’t know our beverage cola shopper is buying for a children’s party, then how do we know that we should be bundling with other flavours and other products? Occasions link both shopper and consumer in that a shopper buys for a particular occasion and a consumer consumes for a particular occasion. The problem here is that it either hasn’t been done very well or it’s in the ‘too hard basket’. Finally, location of decision making is becoming more and more important with the infiltration of technology in our regular day. Jim Lecinski from Google said it best when he coined the “Zero Moment of Truth”. That is, the shopper is now informing themselves to make choices before they get to the store. Once they’ve bought, they are also offering their points of view in the “Second Moment of Truth”. Smartphones are only making this ‘moment’ even more important. While some may look at this as adding complexity, what it presents to others is an opportunity to bypass traditional routes of communication. And when it comes to decision making we need to be able to understand what they decide on pre-store, at shelf and post-purchase, as this will ultimately determine what shoppers buy and whether they come back.